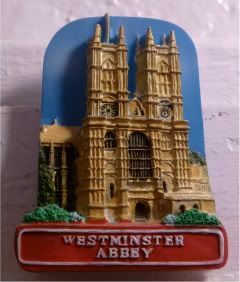 One of the coolest places to visit in London is Westminster Abbey. There's been a religious structure on this site since as far back as 960, when Dustan, a Benedictine monk from London, and a dozen of his buddies set up shop here. Dudes. The 10th century. That's 1,050 years ago! Sure, the present church has really only been there since 1245, but how many buildings have you been in that are a hundred years old, much less almost a thousand? It's nuts. And when you walk in, you can feel the history oozing from every nook and Poet's Corner, from every stone and Coronation Throne, and from every step and funerary monument. It's where almost every British monarch was crowned since William the Conquerer in 1066, and it's the final resting place for at least 17 monarchs. This place has seen more history that could fit in anyone's history books. It has to be seen to really be believed. Remember last year, when I visited Basilica di Santa Croce in Florence? Santa Croce may have Michelangelo and Galileo and a few others, but man, Westminster is just like it...but on speed. Chaucer's there. Chaucer. Buried in 1400. And he's just one. Shakespeare. Darwin. Keats. Shelley. Dickens. Newton. Olivier. Those are just the ones I could think of off the top of my head! There are so many famous folks buried and/or commemorated in the abbey that you'd need at least a couple of days and a couple of tours before you can see everyone. The list is so long, that it's not even complete! It truly reads like a who's who in British history, and makes you realize what the Brits have contributed to this world. Can you imagine what it's like in the dead of night when all the spirits are chatting each other up? Because you know the spiritual din in that building must be crazy. And the conversations they're all having? You know, if I weren't creeped out by crypts and monuments and statues of dead folk, I probably would have spent much more time there if I could. As it was, on my last London visit a couple of years ago, I skipped it, opting for pretty pictures outside, rather than visiting with the dead by myself. What? There's a reason I can't continue watching The Walking Dead on AMC.